While trolley supporters up in Denver view their preserved trolley car this weekend, trolley supporters in Colorado Springs are fighting desperately to save the stub end of the Rock Island Railroad for future use as a commuter line, but short-sighted city officials just see an eyesore and a source of scrap iron revenue they could step in and steal. 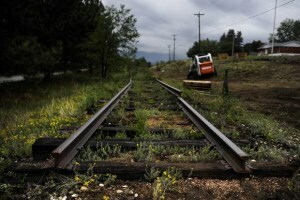 This is part of the Rock Island railroad that once ran between downtown Colorado Springs and Chicago. Recently, the tracks have been intact as far as Limon. I think it is very short sighted that they were not saved at least as far as Falcon. With all the residential development in the Falcon area, this would have made the perfect commuter rail line, connecting a developing residential area to downtown. Instead we will add yet more lanes to Woodmen or Constitution. Indeed it would make the perfect commuter line! The entire north and east sides of Colorado Springs residents would benefit. Instead of routing traffic to US 24 and forcing more commuters to sit in their cars and travel a longer route, Colorado Springs could keep this line and implement light rail or commuter rail at a fraction of what Denver would have to pay for right-of-way acquisition. What are the civic leaders of Colorado Springs thinking? Is it really time to eat the seed you saved for planting?